There is a problem with discussing Charles LeDray's work and illustrating it with photos. Untitled is a perfect example of this problem. LeDray has taken a suit (really a sportscoat, trousers, a dress-shirt and tie) and cut a tiny homunculus-version of the suit. Clever, no? Except what you can't tell from this photo is that the original suit is itself tiny--only a very, very small person indeed could ever wear it. 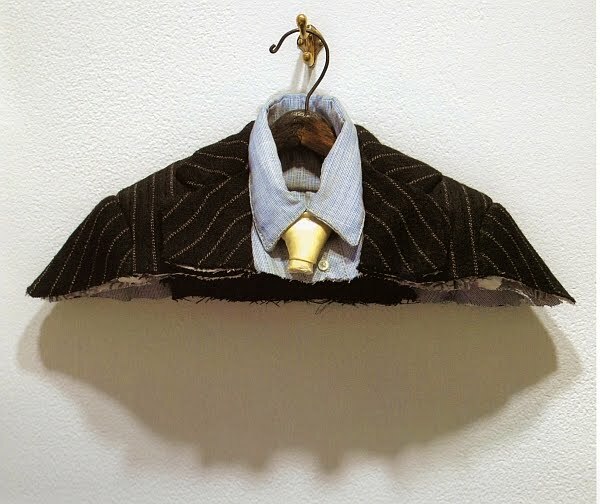 LeDray has taken a tiny, hand-made suit and fabricated an even tinier, hand-made suit from it. Even the scale of LeDray's work feminizes it. It is anti-monumental. I compare him to Hogancamp because it gives me a small handhold onto understanding the work, which I love. Gender is a part of it, but the urge to create something small--a small world, even, is also part of it. With both artists, I think of people who build small cities or buildings. Model railroad enthusiasts, for example, or doll house fanciers. There is, in some , a desire to reproduce the world in a small but highly accurate scale. There is usually an idealizing effect. The model railroad enthusiast creates a kind of ideal village for his train to pass through. 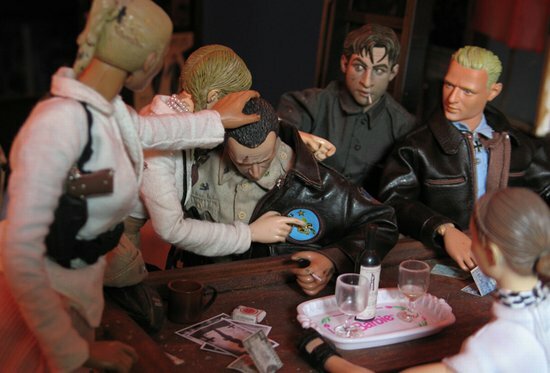 Marwencol is kind of a paradise--albeit one always threatened by war. These scale models are private utopias. LeDray is idealizes to an extent, but he also destroys his own handiwork in weird, humorous ways. He reminds me of the vaudevillian funny-men who would take scissors to the straight man's tie. But here, LeDray is both the joker and straight-man. 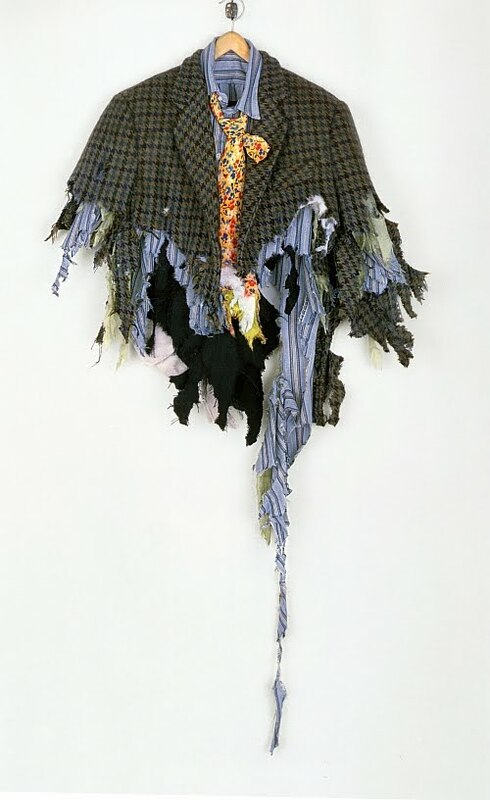 He painstakingly makes these beautiful, tiny clothes, then wrecks them. 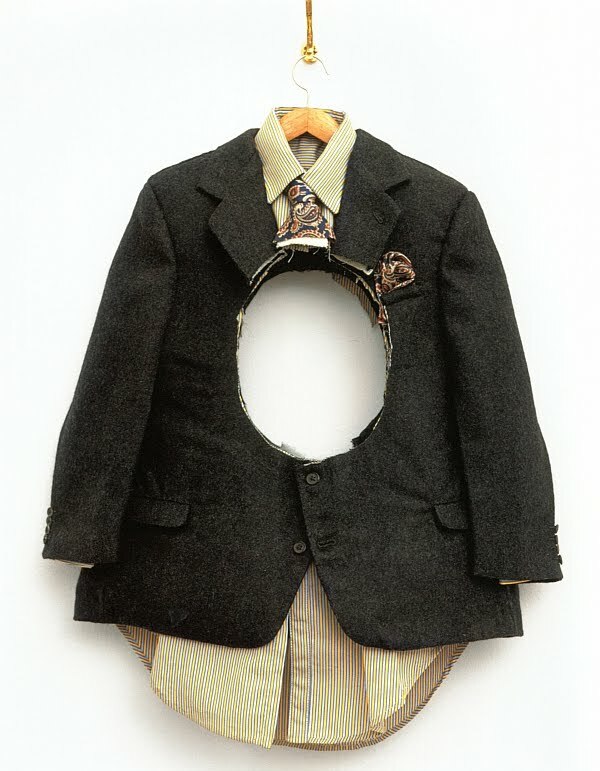 Despite the images I have just shown you, most of the tiny clothes displayed in this exhibit are not torn or cut up. Instead, LeDray has made a variety of clothes in more-or-less perfect condition. Most, but not all, are men's clothes. At some point, just making the clothes was not enough, it seems. 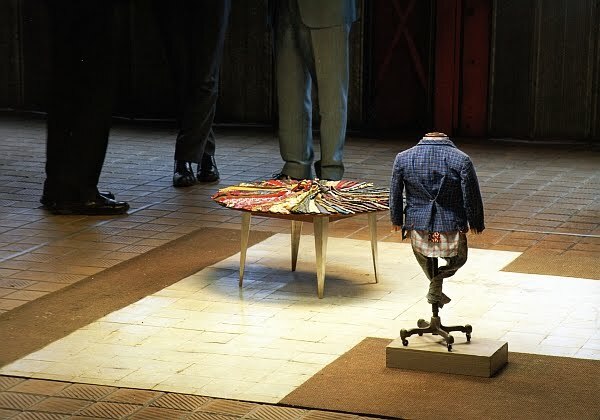 Like Hogancamp, like the model railroad and doll house enthusiasts, LeDray decided to create a scenario, a scale-model environment, one that was meaningful to him: a men's clothing store. 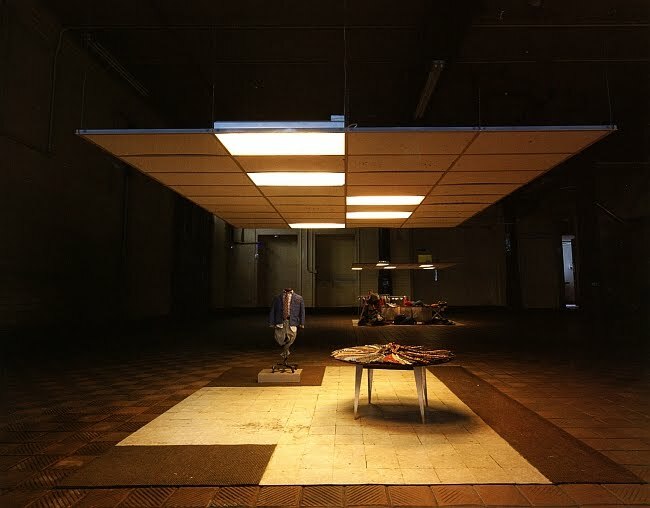 Walking in to see this three-part installation is an astonishing experience. The first sensation you have is like that of walking into Legoland--delight at seeing something familiar recreated on a small scale. The attention to detail is amazing (as it is in all LeDray's work--nothing feels partially finished, nothing is a sketch or a proposition). This photo gives you an idea of the scale of it. In fact, as a viewer, you stand above the drop ceiling and lighting fixtures. LeDray's attention to detail is so great that he has even depicted the top of the drop ceiling realistically--it is covered with tiny scale-model dust bunnies. So what is one to make of this tableau? We all bring our own associations to art. When I first saw it in New York last December, my reaction was--oh, very clever. But not much else. Seeing it again here in Houston, it made me think of my favorite clothing store, Harold's, which is closing down after 60 years. It actually now seems like a monument to a vanishing institution--a store where you buy a suit. After all, who wears suits all that much anymore? And here's where that play of masculine/feminine becomes delightfully confused. A place like this is historically a refuge for men; it's like the barber shop or the cigar store. 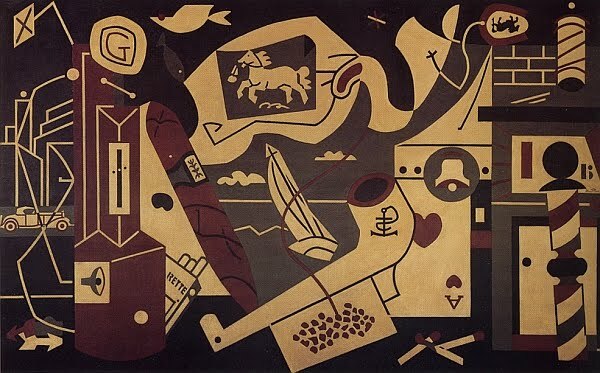 Indeed, I'm reminded of Stuart Davis's 1932 mural at Rockefeller Center, Men Without Women. I have to tell you--buying a suit in a department store like Nordstroms is a very different experience than buying it in a men's clothing store. Maybe that's the simple meaning here--an homage to a vanishing institution. Again, there is a kind of utopian nostalgia in the project of making small-scale environments. Of all the things LeDray could have made, he picked a men's clothing shop. Except that's not all. This is a three-part piece. The elegant store in the first part. Then in another part, you see what looks like the back room of a dry-cleaners. So in part one, you buy the suit and in part two, you use the suit. The third part is a thrift store--you have discarded the suit. 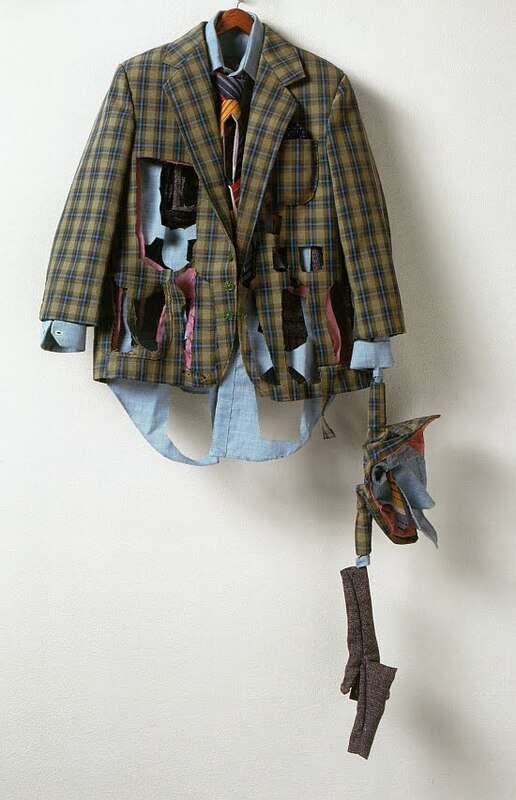 The three spaces LeDray creates tell the life story of a suit, excluding the very beginning (manufacturing) and the very end (discarding as unwearable rags). Anti-monumentality is a big aspect of LeDray's work, obviously. In some pieces in the show, he carries this to a logical extreme. The opposite of one big thing is a lot of little things. 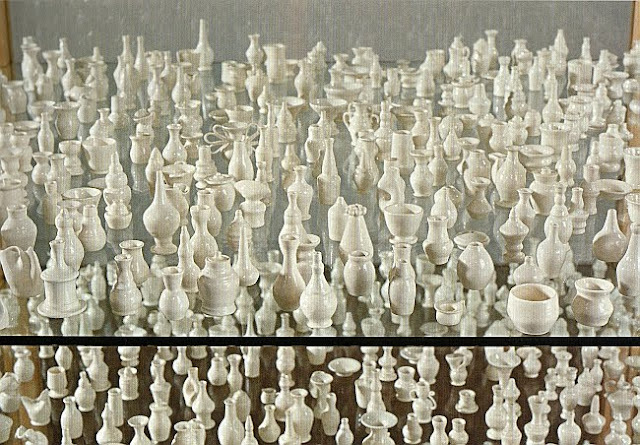 Each of the tiny vases and teapots in Milk and Honey is an inch or two high. (And this is one of four similar works in the show.) Throughout his work, LeDray seems to be undercutting a masculinist aspect of Modernism. He rejects the big heroic piece--the enormous paintings of the abstract expressionists (and many artists since), the giant steel monuments of Mark Di Suvero, Richard Serra and others. Works that seems to say, "Look on my works, ye mighty, and despair." This is never LeDray's message. If anything, he replaces hubris with homeliness. Like Shelley in the "Ozymandias," LeDray sometimes makes a point of reminding us of the vanity of our ambitions. Indeed, some of his works are vanitas sculptures. I was particularly struck by this one. 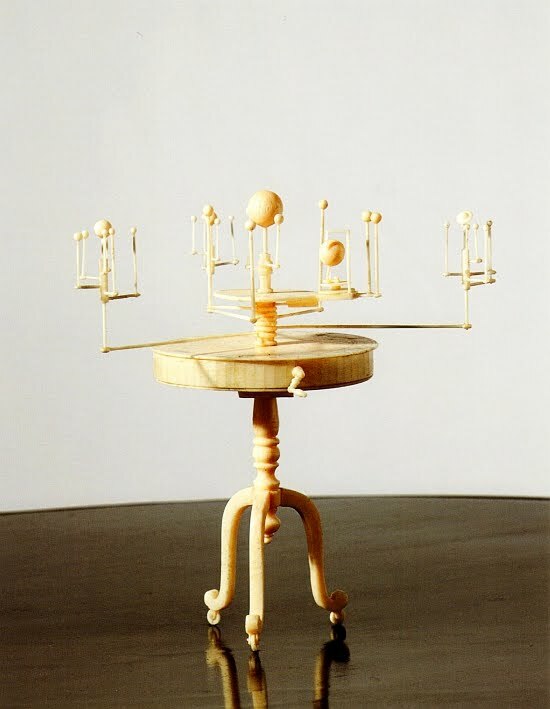 This tiny orrery is carved from human bone, under a glass bell jar. An orrery is a now obsolete object, a mechanical model of the solar system. They reflected the flowering of human knowledge about the universe that began in the Renaissance and continued through the Enlightenment. But as those Dutch vanitas painters knew, all this wisdom was no match for death. I've seen this exhibit twice--once at the Whitney in New York, and once at the MFAH in Houston. In the Whitney, it was displayed in fairly intimate galleries. At the MFAH, it was exhibited in the huge mezzanine space of the Law building. This space was designed by the great master of high modernist monumentality, Mies van der Rohe. And it's perfect for large artworks, but it seems to overwhelm LeDray's diminutive work. This show would have been better served in another part of the museum.But this is a small complaint, and certainly should not prevent you from seeing one of the most exciting exhibits in Houston this year. PBS Independent Lens showed 'Marwencol' recently. I recorded and watched it last night. Mind-boggling details, very impressive. As interesting and well-written as you review is, you have either unintentionally missed or intentionally ignored three (arugably the most important) aspects of LeDray's art-making: gay culture in the era of HIV/AIDS (which is about loss and powerlessness, to which everyone can relate); psychological traumas of personal judgments and exclusion/marginalization/omission; and, obssessive fetishism. I will grant you the first one for sure--I thought about it but didn't include it because I felt that would require me knowing a little bit more about LeDray personally, and I really know nothing about him personally, including the milieu of his early work. (My own ignorance was somewhat corrected after I attended a lecture on LeDray by Bill Arning--but that came after I wrote this). I didn't want to jump to conclusions without knowing more. I didn't want to write about something where I didn't have sure footing--I don't think I would have been doing service to my readers or the work if I had. As for the second two points, I'm not sure what you really mean. There is a lot implied by what you're saying--a whole universe--and to understand where I've fallen short, I'd need to know more about what you mean by traumas of personal judgment and obsessive fetishism in relation to this body of work. In fact, I would very much welcome a more detailed response. LeDray's work feels deep and complex to me, and my brief review cannot reflect more than a tiny facet of it. In short, tell me more.